Tom Petschke & his Petschke Pick products headlined the premier episode of Louisville Dream Funders. After featuring the Petschke Pick in the Life of A Bourbon Barrel last month, a sample of Petschke Picks arrived in the mail at BZ Headquarters in St. Louis. The Petschke Pick is the creation of Tom Petschke who noticed how much more enjoyable chewing on a toothpick was when he dipped it in his after dinner bourbon. 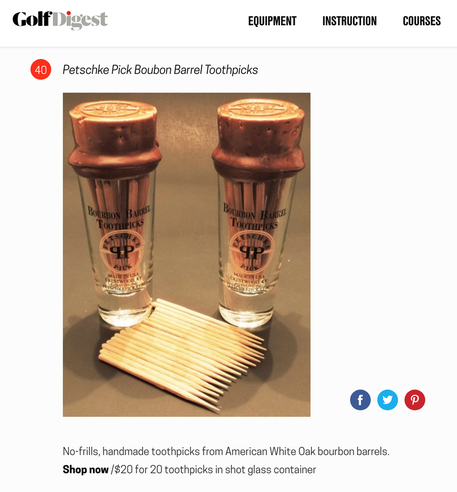 He set out to create the ultimate toothpick by using freshly dumped bourbon barrels still soaked with our favorite distilled spirit to create the most unique toothpick on the market. Upon arrival, I noticed how great the product looks. The picks come in a shotglass with a wax seal on top. As soon as you pop that wax seal, and uncork the shotglass, you start picking up the scent of bourbon. I put a Petschke Pick in my mouth. While I didn't get an immediate taste of bourbon, after about 30 seconds here came a wave. The pick itself is amazing. I don't know that "artisan" and "toothpick" have been put together before, but those words work perfectly together here. The Petschke Pick has a rounded side so you aren't stabbing the inside of your mouth and a pick side if you do in fact need to put it to work. The real beauty of this item is the fact it becomes an experience. The Petschke Pick doesn't splinter and it doesn't turn into pulp if you have it in your mouth for longer than 15 minutes. In fact, with my initial run, I was busy working on this issue of Bourbon Zeppelin and kept it in my mouth for over 3 hours. Three hours! It was still as solid as when I started and delivering a nice taste of bourbon. ​Drinking bourbon is all about indulgence and the Petschke Pick is certainly a fun little indulgence to enjoy from time-to-time!